Michigan's method for funding public education changed significantly when voters approved Proposal A in 1994. The nearly 400 pages of laws directing the state's school funding mechanism can be complex and convoluted. A key component of the system is the per-student "foundation allowance," and two common myths pertain to it. First, each year the Legislature establishes a "basic" foundation allowance ($7,151 per student in the 2009-2010 school year), which many incorrectly assume is a state grant to each district. It's not a grant, but one part of a complicated formula that limits per-pupil funding disparities across districts. Second, because each school district uses the number generated for it under the foundation allowance formula to estimate its annual operating revenue, many believe the figure represents the total amount per student that each school will have to spend for the year. The rest of each school district's annual operating revenue comes from an 18-mill property tax on the district's nonhomestead property (i.e. commercial, industrial, etc.). The amount this raises in a particular district varies, and the amount is also included in the foundation grant formula. The combined revenue from this tax and the state school aid grant represents the total amount the school will have to spend for operations under the Proposal A funding mechanism. Schools also get operations funding that is totally unrelated to that mechanism (such as "categorical" grants described below), and other non-operational revenue from millages levied to pay debt service on long term capital investments like new school buildings. In 2008 the average school district revenue from all sources for all purposes was $12,825 per pupil — significantly more than the foundation allowance. The above is a highly simplified description of how the Proposal A foundation grant system works. The reality is much more complicated. For example, the "basic" foundation allowance is actually a cap, or the maximum amount of state school aid grant money to any district when all the other factors in the Proposal A formula are calculated. Most districts get less than the "basic." Because the formula includes several other factors, including how much the district raised and spent prior to Proposal A's passage in 1994, there is another figure called the "maximum foundation grant" ($8,433 in 2009-2010). Although the "basic" and the "maximum" figures are different, they still represent the same thing: caps on a school's maximum state school aid grant under the foundation allowance formula. In addition, and easier to understand, schools get other money from the state which is not determined under the foundation grant formula. In 2009-2010, the Legislature approved 40 different types of supplementary "categorical grants." These are distributed based on myriad factors ("categories"), including districts' special education and "at-risk" student populations, location, enrollment trends and local tax base. Other revenues come from the federal government and are distributed through targeted grants. Most of these are prescribed by the federal No Child Left Behind Act and the Individuals with Disabilities Education Act. Money from 19 different federal programs is apportioned by the Legislature, but schools also may qualify for separate funding directly from Washington through a host of other grant programs. In addition to the 18-mill nonhomestead property tax discussed above, there are also separate "local" revenues from millages levied by regular and intermediate school districts. Most of the former go to pay for capital expenditures (buildings and land), with the ISD levying taxes for special and vocational education, plus general operating expenditures. The Michigan Department of Education reports that total public school revenues in 2008 were comprised of 54 percent state sources, 37 percent local sources and 8 percent federal sources. When all of these revenue streams are included, total per-pupil revenues are substantially higher than the amount allotted through foundation allowance or state categorical grants. As mentioned, total per-pupil revenue in 2008 was $12,825, well above those "basic" and "maximum" foundation allowances. 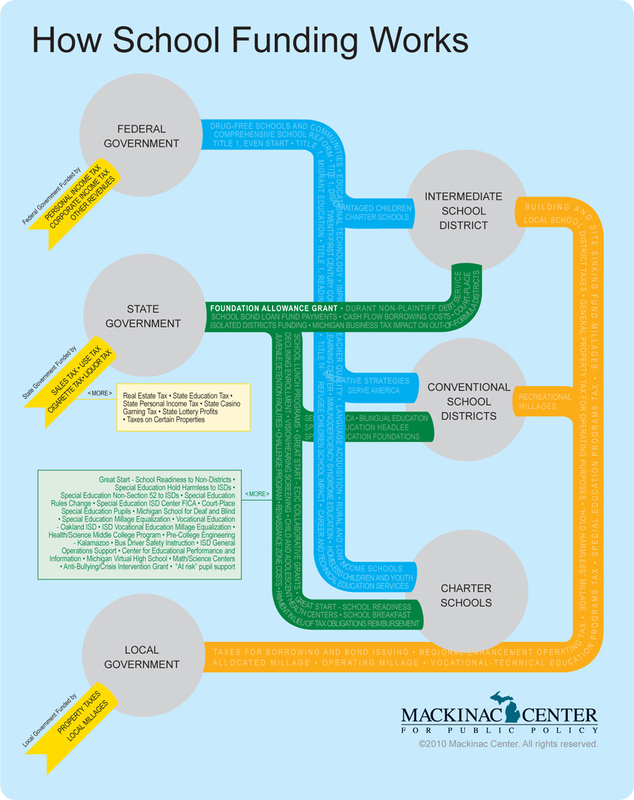 As can be seen, the foundation allowance is just one part of the complex school funding system in Michigan. Not surprisingly, it's easy for taxpayers — and even school officials and legislators — to misunderstand how it works. Michael Van Beek is director of education policy at the Mackinac Center for Public Policy, a research and educational institute headquartered in Midland, Mich. Permission to reprint in whole or in part is hereby granted, provided that the author and the Center are properly cited. Author's calculations based on data from the Senate Fiscal Agency. See http://www.senate.michigan.gov/sfa/Departments/LineItem/LIk12_web.pdf and http://www.senate.michigan.gov/sfa/Departments/DataCharts /DCk12_PupilHistory.pdf. The 2007-2008 school year is the latest available data pertaining to total school revenues. For more details, including individual districts' revenues, see http://www.mackinac.org/depts/epi/fiscal.aspx.